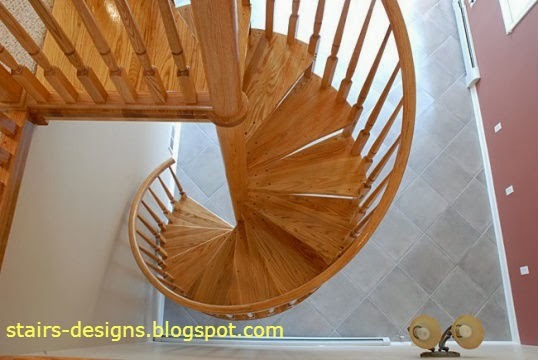 Spiral staircases are used in those houses where you save storage space. To build it is simple, it is much harder to calculate. Stock up on drawings and make payment. For example, you want to build a staircase, where the width of S = 0,8 m and height H = 3m. First, determine the value of the overall diameter D. To do this, double-wide march should resign diameter main support columns. If the central supporting column thickness of 0.2 m, this spiral staircase will have a diameter D = 2xS + b = 2xO, 8 = 0.2 to 1.8 m .
Take a graph paper. From the center line of fabric describe a circle with radius R = D: 20,9 m, in which it is necessary to write the column, having a radius r = 0.1 m Next radially R1S: 2 + r = O, 8:2 +0,1 = 0.5 m describe another circle. She is on the plan of the spiral staircase is a projected line shoot. Now we need to determine the number of steps n, which will be placed on a single turn of the ladder. To do this, divide the circumference into parts that are equal to the desired width of the steps on the line s shoot up. Eg. If you take steps beyond the width of the line shoot value s = 0,2 m, the number n = 2xPR1: s = 2x3, 14x0, 5:0,2 = 15. Divide the circle into n (in this case, the number 15, the number of steps) and spend radius line from the center to the n parts. The ladder man must go up and down freely and does not touch the head of the internal side of the steps above him. For this is a slight excess. If, for example, the growth of walking up the stairs is 1.9, then this growth must also add the stock and thickness steps. 0.2 respectively 0.0 m and 5 m in view of the fact that the steps are made out of «fiftieth board." It turns N1 ​​= 1.9 +0.2 +0.05 = 2.15 m The height of one step h is obtained by dividing the height of a full turn by n. As a result, h = H1: n = 2,15:15 = 0,14 m .
The number of steps determined by dividing the height of the stairs at the height of a single step. The total number if H = 3, n = 21 turn. While the number of treads will be equal to n -1 = 21-1 = 20. Missing in the tread width compensate when arrange overhang steps. But they must not protrude more than 0.09 m.
Note that if you increase the diameter of the middle column, the steps are obtained in the form of trapezoids, and also the fact that the direction of the input and output for n = 21 do not match. Marches spiral staircases make wide 0.95 m.